Firstly she is 100% not using it as an engagement ring if you Google it you will find she has a canary yellow diamond engagement ring, secondly why should she have to return it if she brought it fair and square? When it was up for auction they knew it was a possibility that it would be brought by an non British buyer, if it was such a national treasure then maybe the government should have brought it themselves, Finally Kelly has genuine interest in Austen and her works and did certainly not purchase it to make her seem better than anyone else! This would have been simplified had the fact that the ring had to stay in England was made clear prior to the auction. Of course one’s first reaction is that the British government should have bought the ring outright, but the art world has various reasons not to want this to be the case. The main one is that an item has to go to auction in order to establish its true market value, to give a fair and proper return to the seller. The exception arises when impoverished aristocrats can’t pay death duties or taxes, and offer to donate a few Titians to the national collection in return for concessions. Art of that stature already has a global value. I vote with Mags on this issue! Several of us NY State Janeites have already independently agreed that the Alberta Burke example is the one to follow. The question is, will Clarkson do this? Frankly, I know nothing about her. This is total speculation, but–I get the feeling that she is kind of alone in her Austen fannishness, and she just didn’t think it through, that others would consider the ring something not to be kept away from all of us. Do you know what I mean? So I’m hoping that some gentle persuasion (hee hee) might get her to follow in the footsteps of Augusta Burke and Sandy Lerner and others, and–whenever it might happen, now or as a bequest many years from now–leave the ring where it can be seen and enjoyed by others. And maybe even in the meantime, lend it out upon occasion to be exhibited, as HM the Queen does her tiaras. 😉 I think there is possibly a deal to be struck here. If she promises it will eventually come back, perhaps the Brits will let her keep it for a while. Since the news resurfaced I’ve been voicing the opinion that if it needed, some of us Janeites would be willing to contribute with our “tuppence” in order to buy the ring back. The only place it should be it is the Jane Austen House Museum (If they could start a fundraising that would be the thing). By now, I know opinions are divided in this matter, there are those who believe that it should have been explicitly stated before the auction that the ring was not going to be allowed outside UK. IMNSHO, it was implicit. As a non-British, I would never have expected, if I would have had the money to enter in this kind of auction and win, to be able to take such an unique item out of the country of origin. I believe no one expected that some foreign and ‘private’ person would win the auction and with apparently the intention to keep it for personal use. Usually in this kind of auctions, institutions are the real bidders or some private one does but with the purpose to give it to those institutions. Judging from how high the bidding went beyond both the starting and the estimated price, I think the institutions also wanted to get it but this ‘private’ buyer ended offering beyond the maximum estimated by institutional bidders. I am in complete agreement that the right thing to do is donate it or lend it indefinitely to a museum. It is not an object for personal use nor to be showing it off. I could be even more severe by stating that a true Janeite is very aware of that. This is a moment for the winner to show her quality. But if she is not willing, why not pool resources and buy it back. Sadly, there are also opinions that say the British government should have bought it in the first place instead of allow it go to auction or even why did not the previous owner donate it in the first place to the proper institutions, instead of asking such an action from the auction winner. IMNSHO those reasonings are not sound, that is not how things work in this world. Beside Mrs. Burke’s reluctant example, do we not have also Sandy Lerner’s one? That’s a good compromise–she retains ownership and lends it to a museum to be displayed. Kelly Clarkson would be a Janeite heroine forever if she did that. We say nothing about a Picasso leaving Spain for a private collection, why is this different? Because we love Austen? Aside from speculation that Clarkson would wear the ring, which would be her right as the owner, we don’t know what her plans for it are. Private collection? Donation? And who’s next? The owners of rare first editions? Are they too to be tracked down and demand their books be given up? If Clarkson chooses to sell the ring or donate it – that’s her business. Perhaps the government will advise future auctions to make it clear where, what they deem as national treasure, are destined to stay thus making all of the treasure’s fans on equal footing. Don’t vilify Clarkson: she only loved too well. batblogger writes, “Perhaps the government will advise future auctions to make it clear where, what they deem as national treasure, are destined to stay thus making all of the treasure’s fans on equal footing.” Actually, this sort of decision is made frequently – I can’t believe that any of the major auction houses would not have included the detail in background information for serious bidders. Of course that’s my own opinion, and I will never be a serious bidder on anything, but until Kelly Clarkson or the auction house tells us, we can’t assume that she didn’t know. There are plenty of first editions around (relatively), including in library collections where they are available to the public (not in circulation, of course, but if you ask nicely you often get an audience). There is no reason for anyone to demand their return. Considering that British museums are chock full of priceless artifacts looted from other countries, this strikes me as both ironic and heavy-handed. If the Brits were so adamant about keeping it in the UK, they should have been smarter about its sale and purchase. It’s a bit late to climb on that high horse. I do not see why Ms. Clarkson (or any purchaser) would be obligated to Janeites (and I am one) or to anyone, or be pressured to donate or lend the ring. It would be swell if she did, but that should be entirely her choice. And in the meantime, she should be free to enjoy what she legally purchased. Thank you. I have no sympathy with the UK on this issue. How many countries have demanded the return of their valuable artifacts and the UK either refuses or demands millions of dollars as a price? I just can’t. Dear Imani the call for the British Museum to return artefatcs has been loud and clear for years. It does have a returns policy based on the need of the request. If the people requesting the return of an artefact can prove it’s present religious or social value to their group, often it’s an indigenous tribe, they can get an artefact returned. The Maoris are an example of recent artefacts returned to them for religious reasons. The British Museum is a very special centre of world culture..It has gathered artefacts over the centuries from every great world culture and also indigenous tribal cultures. It is a misnomer to call it The British Museum because it is not about Britain. It is a museum about the world. By bringing all these cultures together it has enabled us as a human race to understand ourselves, how cultures compare,indeed what culture means and how we interact. The British Museum has written world history. We would not have a world history without the British Museum and hence an understanding of ourselves. It is that important. It is possible to say that the British Museum is vital to World Culture. It is financed by the British taxpayer and is totally free for you and anybody else to visit it. Other world cultural centres are The Smithsonian, based in Washington, The Hermitage in St Petersburg, and The Louvre in Paris. They are there for the human race..
As an addenda to the above. Kelly Clarkson is obviously not a world heritage centre despite what some people might think. Tell that to the Greeks who have been trying to get the Elgin marbles back – where they rightfully belong – for a very long time. The Acropolis Museum is also vital to world culture and there is no ethical reason why the marbles should not be returned there. But of course, the UK won’t. The British Museum, the Metropolitan Museum of Art, the Louvre and other great public collectors of culture have good reason to fear a slippery slope if the marbles ever do go back. No one is suggesting Ms. Clarkson is a world heritage centre. My point is that this “Jane belongs in the UK!!!! !” attitude is a day late and a dollar (or a pound short). Auctions do determine market value. But surely there are some wealthy British collectors out there who could have purchased it at auction just as easily as Clarkson. This was not a secret sale. Nevertheless, the woman has been gracious enough to agree to sell the ring if a buyer (or campaign) comes forward to match the price she paid for it last year. If the UK is so keen on keeping it, they sure as heck should come up with the money. Otherwise, Ms. Clarkson is a legal purchaser and a fan of Austen. She is also, after all, a citizen of a former British colony, so maybe that counts 😉 I hope very much that she will take excellent care of the ring and that one day it will find itself in a museum setting. I am partial to the Morgan and I think that would also be an excellent home for it, right alongside with some of her manuscripts. The Morgan mounts beautiful exhibitions and I am sure they would do the ring justice. Jane belongs to everyone, even those of us on this side of the pond. Did Clarkson agree to selling the ring to a UK buyer, or is the piece in government limbo, allowing the sale to be thwarted? After revealing that she was the buyer, I didn’t know she made further comments about the latest attempts to keep the ring from being exported. Maria here is a quote from the British Museums website about the Parthenon marbles. You might not a gree with it. The web link, here attached from the Bm also gives a link to the Greek minister of culutres website. The arguemnet will continue but it seesm the Bm will not hand them back. The Parthenon in Athens has a long and complex history. Built nearly 2,500 years ago as a temple dedicated to the Greek goddess Athena, it was for a thousand years the church of the Virgin Mary of the Athenians, then a mosque, and finally an archaeological ruin. The building was altered and the sculptures much damaged over the course of the centuries. The first major loss occurred around AD 500 when the Parthenon was converted into a church. When the city was under siege by the Venetians in 1687, the Parthenon itself was used as a gunpowder store. A huge explosion blew the roof off and destroyed a large portion of the remaining sculptures. The building has been a ruin ever since. Archaeologists worldwide are agreed that the surviving sculptures could never be re-attached to the structure. By 1800 only about half of the original sculptural decoration remained. Between 1801 and 1805 Lord Elgin, the British ambassador to the Ottoman Empire, of which Athens had been a part for some 350 years, acting with the full knowledge and permission of the Ottoman authorities, removed about half of the remaining sculptures from the fallen ruins and from the building itself. Lord Elgin was passionate about ancient Greek art and transported the sculptures back to Britain. The arrival of the sculptures in London had a profound effect on the European public, regenerating interest in ancient Greek culture and influencing contemporary artistic trends. These sculptures were acquired from Lord Elgin by the British Museum in 1816 following a Parliamentary Select Committee enquiry which fully investigated and approved the legality of Lord Elgin’s actions. Since then the sculptures have all been on display to the public in the British Museum, free of entry charge. Sculptures surviving from the Parthenon are located in museums across Europe. The majority of the sculptures are roughly equally divided between Athens and London, while important pieces are also held by other major European museums, including the Louvre and the Vatican. Recently the Greek authorities have been removing the sculptures from the Parthenon, work that was begun over 200 years ago by Elgin. Nearly all of the sculptures have now been removed from the building. They are displayed in the New Acropolis Museum. The sculptures in London, sometimes known as the ‘Elgin Marbles’, have been on permanent public display in the British Museum since 1817, free of charge. Here they are seen by a world audience and are actively studied and researched to promote worldwide understanding of ancient Greek culture. The Museum has published the results of its research extensively. Recently, for example, new discoveries of ancient applied colour on the sculptures have been made with the application of special imaging technology. The British Museum tells the story of cultural achievement throughout the world, from the dawn of human history over two million years ago until the present day. The Parthenon Sculptures are a significant part of that story. The Museum is a unique resource for the world: the breadth and depth of its collection allows a world-wide public to re-examine cultural identities and explore the complex network of interconnected human cultures. The Trustees lend extensively all over the world and over two million objects from the collection are available to study online. The Parthenon Sculptures are a vital element in this interconnected world collection. They are a part of the world’s shared heritage and transcend political boundaries. The Acropolis Museum allows the Parthenon sculptures that are in Athens (approximately half of what survive from antiquity) to be appreciated against the backdrop of ancient Greek and Athenian history. The Parthenon sculptures in London are an important representation of ancient Athenian civilisation in the context of world history. Each year millions of visitors, free of charge, admire the artistry of the sculptures and gain insight into how ancient Greece influenced – and was influenced by – the other civilisations that it encountered. The Trustees are convinced that the current division allows different and complementary stories to be told about the surviving sculptures, highlighting their significance within world culture and affirming the place of Ancient Greece among the great cultures of the world. Tony, I know the BM argument re: the Elgin marbles. Of course, many argue that the Ottomans were occupiers and that the Sultan (who the Greeks accuse of being bribed) had no right to give Elgin the marbles. They are widely considered a plundered artifact, no matter how the BM chooses to spin it. The point remains, if the BM were to give them back to join the other parts of the frieze in the Acropolis Museum, they would be opening the door to having many, many claims made against other antiquities and works of art the BM possesses. For that reason alone, they will equivocate forever, having no intention of ever returning them to Greece. And to be fair, the BM is not alone; many other world class museums would be in the same boat. It’s a complicated situation for which there will never be any clearcut resolution. Ironically, it would seem that Clarkson has much in common with Lord Elgin who admired the marbles and took them back to the UK, away from their home and their context; she admires Jane and wants to take her ring back to the US, away from its home and its context. But she also purchased it fair and square. For me, the question of Jane’s ring is pretty straightforward: it is for sale, the UK wants it, the UK should buy it. Otherwise, they should not get all holier-than-thou with respect to Clarkson’s purchase. For the record, I hope the UK steps up to the plate and the ring goes to Chawton. If Clarkson prevails, selfishly, I hope the ring is eventually donated to an institution here where I would have an easier opportunity to see it. I’m still rooting for the Morgan! The situation at the moment is that the ring has to stay in this country for the next few months, can’t remember how long exactly, to give an English institution, library, museum, Chawton Cottage etc time to raise the £150,000 Kelly Clerkson paid for it. If they can’t get the money in the given time I should imagine Clerkson can take it out of the country. 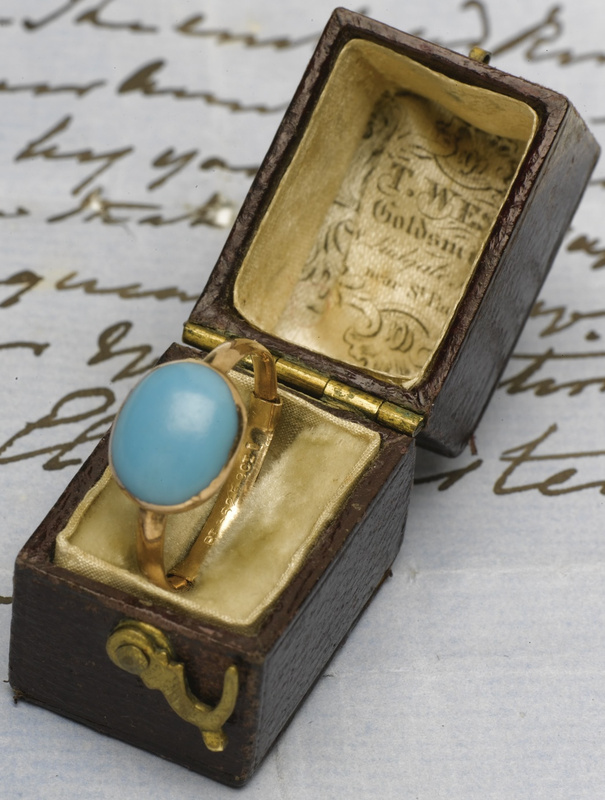 The Jane Austen Museum at Chawton has two rings that belonged to JA. The museum would like the ring to keep three such important Jane artefacts together. They are important in their meaning and the way they help us interpret Janes life. The Morgan Library or the Jane Austen Memorial Trust wouldn’t really be good enough. A very much second best from this side of the Atlantic. My mistake, Mags. of course The Jane Austen Memorial trust owns and runs Chawton Cottage. Yes, it’s they who should get the ring!!!!! A further remark following on from Tony’s, I got the impression from “sources” at the Museum that they didn’t know that the ring was going to be sold until just before the auction, at which point there was no possibility of arranging the necessary funding. If it had been offered to them in the first place, a reasonable valuation might have been arrived at and an appeal for money raised. Ronald, thanks so much for your viewpoint and for filling in some background on the aquisition process. When the manuscript for The Watsons was up for auction, the JA Memorial Trust was part of the consortium that successfully bid for it, with the understanding that it would be kept at the Bodleian Library. I think that’s a good solution, because it keeps the manuscript available for scholars (who would have most of the interest in it) and for possible ogling by the plebes, like the Austen stuff at the British Library in the Treasures Room. However, it’s hard to tell if the same consortium would have been available for an artifact such as the ring, which has no scholarly value. Tony, It just feels right to me that the ring should be with Jane’s other jewelry at Chawton Cottage. The Morgan Library and Goucher College are good stewards of the manuscripts, letters, and other artifacts because they make them available for study by scholars (and occasionally put them on exhibit for all of us to see). As I said above, the ring doesn’t really have much value to scholars as an object–I think it is better displayed where anybody who can get to it can see it. In the words of Indiana Jones “It belongs in a museum!” There are many examples in the art/artifact world where a buyer houses the object in a museum, yet still owns it. This is done for both security and preservation reasons. I’m sure she can come to an agreement with a museum where she can visit it and put it on. When you buy objects such as these at auction in a country in which you don’t reside, you take the risk that you will be barred from taking it home with you. It’s now so widely known that she owns the ring, and it will be public if she is ultimately allowed to take it home, that this ring will be a high target for theft for it to be sold on the black market. Personally I wouldn’t feel comfortable having it in my home no matter how much security I had. I agree that at this point, Clarkson would be a target for theft. I’ve also been a little concerned for the safety of Austen’s ring upon learning Clarkson lost (and thankfully recovered) her own engagement ring a few months ago. I know, I know, it could happen to anyone, but still the first thing I thought of was that I was glad the turquoise ring was still in Britain! Maybe the British government is being rather unfair, since they own artifacts from other countries. Maybe Janeites are being too harsh by saying it’s selfish to own the ring. I don’t think either of these things should persuade Clarkson. She doesn’t have to feel a sense of loyalty to the government or fellow Austen fans, but what about loyalty to Austen herself? Austen could never have dreamed of the legacy she left. 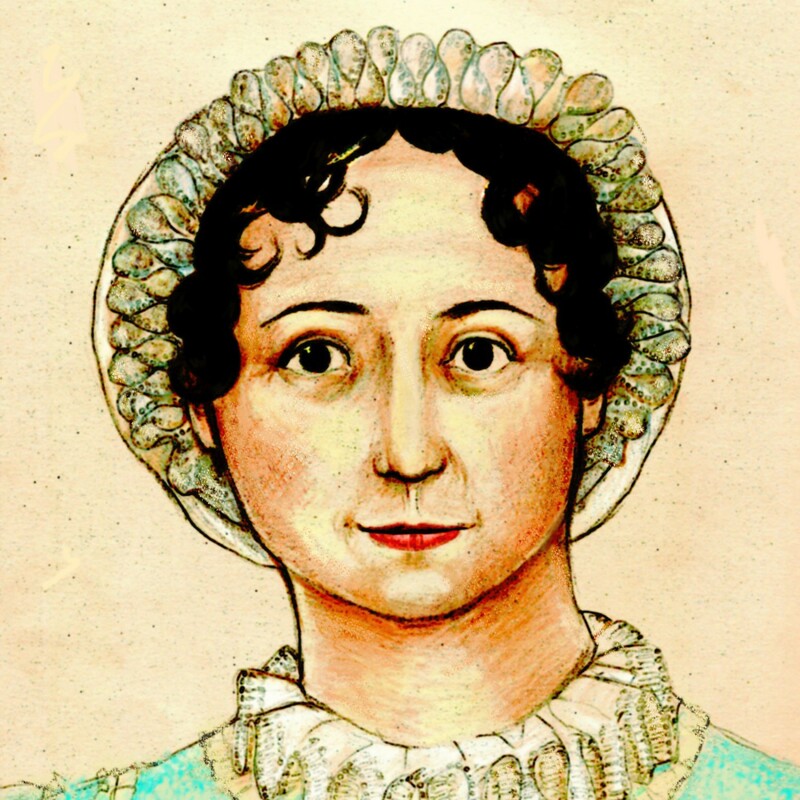 Clarkson’s fame is right before her eyes but during Austen’s life, the recognition was modest. The connection we feel to Austen has made her a modern superstar. Is it wrong to believe that those intensely personal items like journals, clothes, jewelry etc. be together at the house where Austen was able to find some kind of contentment in her final years? Her work is the ultimate legacy but these items allow us to visit, however remotely, the person Jane Austen was. They remind us that before she was an icon, she was a daughter, sister, aunt and friend. She was one of us. Anyone who truly felt touched by Jane Austen would want these things together. First edition books are another matter. They were meant to be owned by others. I understand Clarkson struggled to get a first edition to the United States, but she was ultimately able to do it. Perhaps she thinks the same will happen with the ring…and it just might. Clarkson’s participation in the auction drove the price up beyond what bidding museum-type institutions were able to afford. They may not be able to get funding that high, even with additional time. Clarkson very well may have the ring in her possession by next year. I’m not saying she didn’t have a right to bid. I think some forethought by the the family, the auction house, and the British government could have prevented a lot of this trouble. If Clarkson takes the ring home, I wonder how she’ll be able to keep it safe and well-maintained. I wonder if she understands why some people feel differently about the ring? Something that touched Jane Austen’s skin, that she possibly wore while composing works that still capture the heart hundreds of years later, something like that contains the spirit of the woman, as well as the author, and needs to be protected. I would like to announce that if I win the Powerball jackpot, I’ll buy the ring from Kelly and donate it to the Jane Austen Memorial Trust. I am not joking about this. Just a few more background comments. First, Clarkson did a huge favour to the people (descendants of one of Jane’s brothers, but I don’t know which) who owned, and put the ring up for sale – they’ll have received more than they were given reason to hope for. At the AGM of the Jane Austen Society in 2012 Louise West, the head of the Museum made a plea for anyone who might have similar property and be thinking of selling it to contact them. This year David Selwyn, the Chairman, general editor, and guiding light of the JAS died, before his time. See http://www.bristolgrammarschool.co.uk/News/Sad-news-regarding-David-Selwyn.aspx. And Louise retired from the Museum, again seemingly before her time, to join her husband in his retirement and pursue her own projects. So it’s all change. A new head has been appointed but I was told that that person won’t be starting for a few months. We’ll have to see who puts themselves forward for election to the Chairmanship of the Society, and who is elected – plus most of the committee members, whose terms end this year. I think I read that Cassandra Austen gave the ring to Henry Austen’s second wife when they became engaged, and it was passed down through her family (they had no children).